Wines of great diversity including some exceptionally rare varieties and unusual blends will be setting new benchmarks at the 32nd Nedbank Cape Winemakers Guild Auction on Saturday, 1 October 2016, when 52 individually crafted wines go under the hammer in Stellenbosch. This South African wine industry showcase features small volumes of unique collectors’ wines all made exclusively for the auction by members of the Cape Winemakers Guild. The 2016 auction line-up comprises 32 red wines, 15 white wines, three Méthode Cap Classiques, a potstill brandy and a port making up the tally of 2 429 cases (6 x 750ml case equivalent). “Our members have certainly pushed the envelope this year bringing even more diversity with exciting new styles, interesting varietal wines and unique blends to the auction. The shift to individual wines in smaller volumes and case lots underlines our singular vision to seek out exceptional parcels of vines, boost creativity and ultimately open up new frontiers in South African winemaking,” says CWG Chairman, Miles Mossop of Tokara. 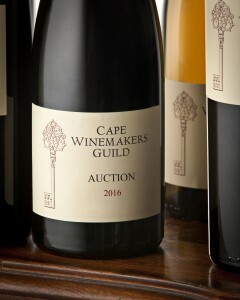 Whilst innovation is an important aspect of the annual CWG auction, the treasure trove of well-established wines of great auction lineage sees small private buyers, more serious collectors and the influential wine trade return year after year for a chance to purchase new vintages of these sought-after heritage wines. Two Guild members, Gordon Newton Johnson and Sebastian Beaumont make their auction debut this year whilst Gottfried Mocke will see his first wine under his own label go under the hammer. The new auction wines are Newton Johnson Family Vineyards Seadragon Pinot Noir 2015, Beaumont Family Wines “Moerse Moer” Chenin Blanc 2015 and Gottfried Mocke Wine Projects Pinot Noir 2015. Another newcomer to the auction is the first ever Clairette Blanche. The 100% Mullineux Clairette Blanche 2015 was crafted by Andrea Mullineux from a 40-year old Swartland vineyard. Another interesting newcomer amongst the 15 white wines is Johan Malan’s Simonsig Mediterraneo 2015, a blend of Roussanne, Grenache Blanc and Verdelho. Chardonnay is the biggest single category with six entries amongst the white wines followed by Chenin Blanc (3), Sauvignon Blanc (2) and Semillon (2). With nine diverse renditions, Shiraz makes up the biggest varietal wine amongst the 32 reds on auction this year, followed by Pinot Noir (5), Cabernet Sauvignon (4) and Pinotage (3). The non-Bordeaux red blends are particularly strong with eight wines versus three Bordeaux red blends. Unusual varieties found in some of these innovative blends should stir up considerable interest at the auction. The Neil Ellis Insignium 2013, a blend of Tempranillo and Grenache; Dewaldt Heyns’ Saronsberg Die Erf Shiraz/Grenache/Mourvèdre/Viognier 2011; and Bruce Jack’s The Drift Farm Kindred Shiraz/Malbec/Barbera 2014, are all bold flagbearers for innovation. The three Méthode Cap Classiques to go under the hammer this year are from Graham Beck, Silverthorn Wines and Simonsig. Both the potstill brandy and the port are from Boplaas. This year’s magnum offerings are Jan Coetzee’s Vriesenhof Pinot Noir 2013, David Trafford’s Sijnn /awa 2014 (Syrah/Mourvèdre) and Coenie Snyman’s Rust en Vrede CWG Auction Estate 2013 (Cabernet Sauvignon/Syrah/Merlot/Petit Verdot). In another auction debut, the Teddy Hall Wines Maria van Loon née Engelbrecht Shiraz Reserve 2015, will go under the hammer in a 3-litre jeroboam, the first time an auction wine will be sold in this size bottle. Auction stalwarts amongst the reds that are back with new vintages include Beyerskloof Traildust Pinotage 2014, Boekenhoutskloof Syrah Auction Reserve 2014, Boschkloof Epilogue Syrah 2014, Cederberg Teen die Hoog Shiraz 2014, Edgebaston Cabernet Sauvignon Reserve 2013, Ernie Els CWG 2014, Etienne Le Riche Cabernet Sauvignon Auction Reserve 2013, Groot Constantia Auction Shiraz 2014, Hartenberg CWG Auction Shiraz 2012, Jordan Sophia 2013, Kanonkop CWG Paul Sauer 2013, Paul Cluver Auction Selection Pinot Noir 2014, and Rust en Vrede CWG Auction Estate 2013. New vintages of auction faithfuls amongst the whites include Ataraxia Under The Gavel Chardonnay 2015, Bartho Eksteen Vloekskoot Sauvignon Blanc – Wooded 2015, Cederberg Ghost Corner Semillon 2014, Jordan Chardonnay Auction Selection 2015, and Paul Cluver The Wagon Trail Chardonnay 2015. All auction wines are selected after rigorous scrutiny in a blind tasting by the members of the Guild and tested by an independent laboratory to ensure that they meet the highest standards of wine health measurement. Since its inception in 1985, the Nedbank Cape Winemakers Guild Auction has become a benchmark of excellence and the CWG label is widely held as an authentic assurance of quality and craftsmanship. The 32nd Nedbank Cape Winemakers Guild Auction, conducted by Henré Hablutzel of Hofmeyr Mills Auctioneers, is open to the public and will be held at the Spier Conference Centre in the Stellenbosch Winelands on Saturday, 1 October 2016.